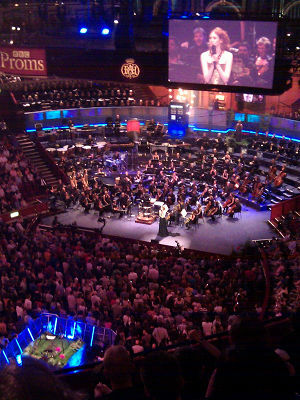 Adam J Purcell reminisces about his visit to the Royal Albert Hall, London, for the Doctor Who Prom 2010 on the 24th of July. It was if part of me had never left the Royal Albert Hall after the 2008 Doctor Who Prom and returning for the 2010 Prom was almost like feeling whole again. Given that 2009 was something of a lean year for Doctor Who, there wasn't a 2009 Prom - the only new Who there had been on our screens since the 2008 Prom at that time was the two specials 'The Next Doctor' and 'Planet of the Dead'. Hardly enough to fill a full Prom and there was little use in just repeating most of the old material (it was out on DVD by that point). 2010 has been rather kinder to us, however: a full new season, a new Doctor and companion and a new 'fairy tale' creative vision that was reflected in giving the music a rather different tone. The Madman with a Box. It was straight into this prologue with female solo vocalist Yamit Mamo and into little Amelia Pond's fairy tale, nighttime, garden. Yamit Mamo was stood at the back of the orchestra in the little square of grass. Stuck in that grass were a couple of little red children's windmills, evoking the garden from The Eleventh Hour. Likewise on the platform in the middle of the standing 'Arena' area of the auditorium was another patch of Amelia's garden, this one with her now famous swing. We are immediately transported to the beginning for the Eleventh Doctor and Amy Pond and this wonderful piece of music is probably unlike anything we've ever had in Doctor Who before. As the prologue finished there was massive applause for Karen Gillan as she swept onto stage to kick off procedings, "wow, there's a lot of you!" She was wearing a very elegant but completely impractical trailing black dress. Beamed up onto the big screen she was, of course, completely radiant. Some people have said she seemed a bit nervous at first but I can't say I got that impression, not at the time nor now listening back to the Radio 3 recording of the event. Talking to a couple of people who weren't lucky enough to be there in person but listened to it on Radio 3, they thought Karen Gillan didn't do the best job of hosting it, they thought Arthur Darvill did a much better job. It's personal opinion, of course, but I think the two of them were pitching it slightly differently. To me, I though Karen was aiming it more at the audience in the Royal Albert Hall - she responded to them rather more and even went off autocue a few times (or so it seemed) and would whoop back at them! Arthur, by comparison, seemed to be more aiming it at the Radio 3 audience. He kept to the script completely (again, as far as I could tell, not being able to see the autocue at this prom) and didn't really respond to the audience, sometimes not even waiting for the clapping to finish to dive staight into his dialogue (some of the time I couldn't even hear what he was saying from my seat). Listening back to the Radio 3 version (with their ability to dial down the audience and dial up the host's audio) Arthur Darvill does seem a bit more 'radio presenter' professional but Karen seems to just be having a bit more fun with it. It's an interesting contrast as, again to my mind, I didn't really detect that difference at the 2008 Prom (and Matt Smith was also a bit more Royal Albert Hall centric, I thought). Before continuing I must point out Karen Gillan's comments of the ecentricies of the new Eleventh Doctor, especially the very funny 'umm' reaction she gave to his fondness of bow ties: "with a taste in tweed jackets and bow ties. ummm..." What's with both her and Amy's dislike for the bow tie?! This second piece of music quickly moved into the pre-credits music from the Eleventh Hour, complete with the complete visuals on the big screen (and numerous smaller ones around). This time we also had the 'dialogue' track running alongside the live music. I put dialogue into inverted commas as Matt Smith isn't really speaking but instead making various groans and little screams! This then moves onto the infamous scene (and, for my money, utterly brilliant scene) with the newly regenerated Eleventh Doctor getting little Amelia Pond to make him dinner! If there is one thing that really was a big improvement over the 2008 Prom, it was the visuals that accompanied (nearly) all of Murray Gold's Doctor Who music. The first Doctor Who Prom, in 2008, had some questionable choices for accompanying visuals at times. All of the 2010 visuals were, again for me, absolutely perfect. As an example, the shots of Amelia and the Doctor in her kitchen were just so well done - expertly and perfectly timed to the music. Unlike the pre-credits TARDIS out of control over London, the kitchen shots were not complete as show on TV. No, all of the dialogue sections were removed, all that was left were the action and reaction shots. I don't know what came first, that specific musical arrangement or the visuals but whenever the Doctor did something funny (like spitting out the beans) the music was timed to the second for it. I really hope they release those videos with the 'live' music. This was the first of the non-Who pieces of music. From its name it sounded a perfect addition to the Prom but I'm afraid it didn't really work for me. John Adams' piece just never seemed to quite get going. Like the first 10 seconds or so of the 2010 Doctor Who theme you can feel as if it is building up the main body of the piece but a 'Short Ride in a Fast Machine' never actually gets beyond that. Very odd. Being a non-Who piece, as with the 2008 Prom, they wisely didn't attempt to match any Doctor Who visuals to it. As with all the non-Who pieces, they instead relayed live footage of the orchestra playing onto the big screen. A noble effort on their part to show the children (and, no doubt, some of the grown ups!) the orchestra sections actually making the music. It doesn't all come out of a computer (or doesn't have to, anyway!) Nonetheless, as before, these non-Who pieces did have a way of disengaging the audience. Fortunately better, or at least better known, pieces of non-Who music were to come but even those more rousing examples probably didn't work so well for the audience as the Doctor Who music they knew and, frankly, came to hear. "Wow, heels, stairs and a long dress: not a good idea!" remarked Karen Gillan as she came back on stage for the third time, with her dress hitched up so as not to trip over and kill herself! And she thought some of the stunts on the series were dangerous! It was back to a more audience pleasing piece with Murray Gold's 'I am the Doctor'. I had feared (or was it hoped?) that this might be a Matt Smith rendition of Jon Pertwee's 1972 single version of the Doctor Who theme with his own lyrics (actually entitled 'Who is the Doctor' but that's not how most of us know it). Instead, thankfully, it was the new Doctor's Theme. Some have claimed that Murray Gold has said (somewhere?) that this new 2010 version of the Doctor's Theme is properly entitled 'Every Star, Every Planet' but there wasn't any mention of that name here. I have to say, before I continue, that I absolutely love this new Eleventh Doctor's Theme. I really, really do. It is such a joyous, manic, fun piece of music. When it really kicks in at the end of the Eleventh Hour (from around Rory saying "Did he just save the world from aliens, and then bring all the aliens back again?") I almost getting a bit misty-eyed, it's just so perfect. Somewhere around that point in the Eleventh Hour The Doctor's Theme builds up so much that they even chuck an organ in and I had high hopes that the massive 'Grand Organ' in the Royal Albert Hall would be called in to do that bit. Sadly, if it was, I certainly couldn't hear it. Instead they use some beefy sounding guitar (a bass guitar? I don't know my instruments very well!) and that works almost as well, it really gave the live performance of this marvellous piece of music that extra kick it really deserves. In the second half of this piece, soon after the guitar comes in, the visuals on the big screen move to the Doctor standing atop one of the standing stones at Stone Henge, warning off the thousands of spacecraft hovering around it. For this they actually brought in the dialogue track again. It worked well enough but, personally, I'd rather have just had the orchestra to listen to - especially for that piece of music. I'm sure it must have pleased some people (it was a great scene and a powerful moment for the Eleventh Doctor, if rendered a bit moot when we discover what is really going on later in The Pandorica Opens!) Given they otherwise studiously avoided having shots of characters silently talking on the big screen, maybe they felt they had no choice in this case. Oh, and if you wonder why about half way through it sounds like an audience member screams and there's a ripple of laughter - this is around the point that the monsters appeared amongst the audience, scaring some poor woman half to death as she clearly wasn't expecting it! This Prom we were treated to Judoon, Cybermen (both returning from 2008), Silurians and the Vampire Women from Venice. Upon returning Karen Gillan giggled "Opps, I'm sorry, I forgot to mention the monsters!" Karen Gillan again seemed delightfully flattered at the welcome she received when she came back on stage! Then two more non-Who piece were up next. As with all the non-Who pieces, these were conducted by Grant Llewellyn whereas the Who pieces were conducted by Ben Foster (who also orchestrates for the series proper and has written music for Torchwood). Mars, for me at least, is a little different as it does have various associations. There's the blatant Quatermass connection (it served as the Quatermass theme tune) and then you can clearly hear the inspiration of Mars: The Bringer of War in, at least to my ears, Star Wars: A New Hope and the original V, amongst others. Having seen Mars (and indeed the entire Planets Suite) played live before and also having two or three different recordings of it on CD, I have to say it wasn't quite the punchiest version I've ever heard but it was, nonetheless, great as ever! The final piece in the first half of the Prom was introduced by a couple of Daleks, after Karen Gillan is chased off stage by a World War II Air Raid Warden! "Oi, you! Put that light out! ", "Sorry!" An Ironside Dalek appeared, raised up on the central platform in the Arena, chanting "I am your soldier." and asking "Would you like a cup of tea and a biscuit?" This Ironside Dalek is himself forced away by the new paradigm white Dalek Supreme, to which the crowd gave a sorrowful "ahhh"! The Dalek Supreme then ordered Ben Foster to play their 'Dalek' music, in much the same way as Davros did in the 2008 Prom. This time, as the characters would suggest, the music is a suite from Victory of the Daleks. At this point I should say what a great and massive choir they had at the Royal Albert Hall for this performance. My memory may be failing me but I'm sure last time they only had the choir on one side of the orchestra, this time they had them on either side, probably giving about double the number of performers! Naturally Dalek music entails a lot of choral work but so did many of the Who pieces, another memorably fantastic performance being for the Doctor's Theme in 'I am the Doctor'. Battle in the Skies was itself a nice and mildly stiring piece but pretty forgettable compared to some of the other Who pieces. I can't help but wonder if they felt they had to include it just because they needed to have the Daleks there. I'm not saying it was a bad piece of music (the spitfire bit is especially good, in fact) but I do wish they'd have maybe expanded a bit more on the Vincent and the Doctor music and I would have liked them to have played the music from The Lodger when the Doctor is playing football. Clearly choices had to be made and I think this piece was choosen less for the music than it might have been, there are other pieces I would personally have prefered. The Radio 3 listeners who were listening along live to our cheering (and occasionally whooping and, a few times, wolf whistling at Karen Gillan) had a rather different experience in the interval than we did in the Royal Albert Hall. They received a prerecorded programme called 'Dance Of The Daleks' to fill the 20 minutes. Back at the Royal Albert Hall, Keith and I sought out Tim Drury, who was down in the Arena (the standing area in the centre of the Royal Albert Hall that you can only buy tickets for on the day). Now the Royal Albert Hall is a big place and it took us a good few, precious, minutes to locate each other. We managed to record a couple of minutes or so for Tim's Podcast (Tim's Take On) before a tannoy announcement told us all to return to our seats for the second part. Being down in the Arena, Tim was very close to the stage and it is well worth checking out his images and videos (Tim Drury's Dr Who Proms 2010 Flickr Set and Tim Drury's YouTube Channel (search for Prom)). Karen Gillan returns to the stage, to much applause and wolf whistling as she is wearing a very different dress - a thigh length number with an open back. Much better than the first! She is quickly interrupted though, telling us the hall's sound system has gone down... Suddenly, up on the big screen, Matt Smith appeared as the Doctor. He apologised for not being able to be with us, saying he'd arrived in the wrong time. The TARDIS was drawn there by an 'explodey-wodey thing'. Lots of panto-style "say 'Hello, Doctor'", the screen getting turned over and him thinking we are all stuck on the ceiling, etc! In the programme guide Matt Smith was listed third, after Karen Gillan and Arthur Darvill (both listed as hosts). Matt Smith was down as 'special guest appearance'. For a moment there I was afraid we wouldn't actually get to see him but on that pre-recorded segment, like David Tennant at the 2008 Proms. That didn't make sense, there were press quotes of him saying he was a little nervous about appearing at the Prom. Sure enough, the Doctor rushed off the pre-recorded screen, saying he had to take the glowing green ball (that was now beeping to indicate that it was about to explode) somewhere safe. To a roar of applause Matt Smith (or should I say the Doctor?) appeared out of a hatch in the middle of the Arena, pefectly timed to the pre-recorded footage of him climbing up a ladder and out of shot. The next few minutes comprised of the Doctor, live in the audience, enlisting the help of a little boy to defuse the device. The poor little kid seemed more than a little bit bewildered! Some wonderful ad-libbing by Smith to cover the fact that the boy, Ellis, didn't respond how they expected (from what I've seen of the Sunday performance the second little boy did much the same!) When asked if he could see the nothing that Matt Smith was holding between his thumb and forefinger, Ellis naturally nodded a yes (if you were six or seven and the Doctor asked you if you could see something that wasn't there, you'd say yes, too!) It was all very good humoured , although Ellis was taking it deadly seriously, unlike the rest of the audience who were laughing rather a lot at the antics, so when asked "You're not going to giggle, are you?" there was never any chance he would (again, causing Matt Smith to go off script a little - that clearly wasn't the response they expected!) A bit of technobabble and then the Doctor announced to everyone that the Royal Albert Hall was safe. All in all it was a wonderful, heartwarming, little skit and Matt Smith should be congratulated for a brilliant job. He was so putting so much energy into it that he was massively out of breath and at one point he had to just stop for a second to take a breather! To cover that, or maybe just to bring to mind the next line, he panted "Now please excuse me whilst I consult the autocue! No, only joking!" Matt Smith is no stranger to live stage performance, indeed having won an award for his work on 'That Face' in 2007. It showed! The Doctor then left the auditorium. As he was on his way out he consulted someone's programme guide and said he was leaving us in the capable hands of "Karen Gillan and Arthur Darvill and, er, Matt Smith, whoever that is - urgh, what a dull name!" The whole Doctor skit was brilliantly pitched, the audience loved it and it really showed what the 2008 Prom was lacking. 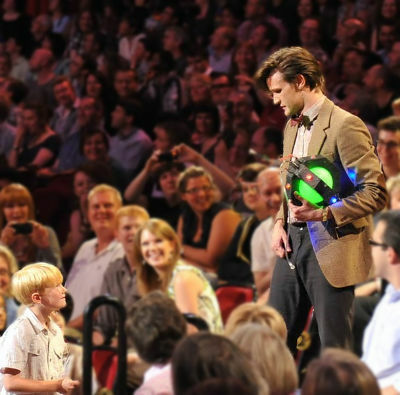 Yes, the pre-recorded Music of the Spheres that David Tennant did in 2008 was good fun but proper audience interaction like this really does bring it to a new level. "ITV has been knocked off the air. Never mind, eh?" Arthur Darvill came on straight after that to yet more great applause. As said before, he was more determined to get through his autocued dialogue without interruption than the other two, "Now calm down, calm down." Perhaps there were backstage concerns that they were already a bit too far behind schedule? Nonetheless he did a great, no nonsense, job of introducing the next piece, simply called 'Amy'. Though before continuing I have to say a few of us snickered, when talking about Amy, Arthur Darvill said "Now it wasn't very easy getting her up the aisle!" We're rude like that but he said it completely straight! Amy's Theme began with the wonderfully haunting music that played during the opening moments of The Beast Below, when the Doctor was holding Amy outside of the TARDIS door into space. Naturally the visuals on the big screen matched the music for that piece. The music then moves into the piece that closed the Pandorica Opens, an equally haunting and evocative piece that obviously brings to mind Amy's understated death and then all of reality collapsing. Oddly calm and tranquil for Amy, I would have thought but somehow it works for her. Undoutably a beautiful piece and that aspect clearly does fit! To more cheering and another wolf whistle or two, Karen Gillan returned to the stage, saying that she thought Amy's Theme was the best piece! After warning us to keep our eyes open wide we were next treated to a suite of music representing the Smilers from The Beast Below (a fairly forgettably theme, to be honest), then to a brief snippet of the much more chilling Silurians theme and then, rather oddly, straight into Vincent's theme (a touching, lyrical theme that seems a little out of place with the monster music otherwise in this suite). Vincent's theme gently plays for a good few moments before kicking into the heart crushing piece that plays towards the end of Vincent and the Doctor, when Amy and the Doctor show him what his work means to people in the future. It's hard not to get a little moved by that! No time to blubb in this piece, though, as it then moved to a tinkling suspenseful, fairy tale, piece which I believe accompanied the creepy Weeping Angels. Naturally a Weeping Angel statue appeared on the platform in the middle of the Arena (no, it didn't move!) whilst Silurians and the, rather attractive, Vampire women from Venice moved amongst the audience. As with the 2008 Prom, they'd done a good job of getting back the original 'monster' artists to reprise their roles live. Certainly the 'Vampire Girls', as they are credited in the programme guide, appeared to be the originals and, judging from their names and the original filming location of the Vampires of Venice, I suspect at least two of them were brought over from Croatia especially. Yes more cheers and wolf whistles can only mean that Karen Gillan had taken to the stage again, this time with Arthur Darvill in tow. Together they introduced us to the last non-Who piece of music for the day - the classic 'The Ride of the Valkyries' by Richard Wagner. This piece was actually also played at the 2008 Doctor Who Prom, the only non-Who piece to get a second outing. Obviously this is one of the true greats of classical music, so there is probably little I can say about it that hasn't already been said much better elsewhere but I did think the BBC National Orchestra of Wales and the non-Who conductor of the day, Grant Llewellyn, more than did the piece justice. Karen Gillan back on stage, on her own this time, responding with great fun to a whoop from the audience when the Tenth Doctor was mentioned "Woo-hoo, yeah!" If you listen to this piece on the Radio 3 broadcast you might have wondered why there was so much cheering during it. On the big screen we were treated to every televised regeneration. A much better visual accompanyment than they managed in 2008 to the absolutely amazing, and constantly tear inducing, 'This is Gallifrey - Our Childhood, Our Home'. I was very glad to hear them do it again in 2010, 'This is Gallifrey' is my favourite piece of Murray Gold music. That then moved on to 'Vale Decem', the piece that followed the Tenth Doctor as he struggled back to the TARDIS for the final time in 'The End of Time, Part Two'. The big cheer early on in this piece is Eccleston regenerating into Tennant. Most of the visuals for 'Vale Decem' were those last moments of David Tennant's Doctor and the final big cheer was, of course, for the regeneration from Tennant to Smith. From what I understand, those people who attended the Sunday performance of this 2010 Doctor Who Prom didn't get the visuals with this piece. I don't know why that would be but it is a great shame, the incredibly moving music with those historic visuals worked so well together. Perhaps some idiot in authority didn't like all the cheering to the visuals when we were there to listen to the music, damnit! I hope not. I dearly hope they put it on the Blu-ray with the visuals. The cheers and applause for the end of This is Gallifrey/Vale Decem quickly surged again as Matt Smith took to the stage, the first time as himself. He introduced us to the 'Pandorica Suite'. Wow, what can I say about this piece? Can I gush any more or am I already gushed out?! Once again I have to really give credit for the people behind the visuals that accompanied the music on the big screen. Looking at the programme guide I presume these people would be the Screen Sequence Editor and Screen Director, Richard Senior and Sian Parry, respectively. Whoever it was, they really excelled themselves with the 'Pandorica Suite' - somehow they managed to condense the entire 'The Pandorica Opens'/'The Big Bang' into about 10 minutes and, as ever, expertly and perfectly timed with the orchestra. As before they only had action and reaction shots, there were no dialogue shots of people silently mouthing things (or any dialogue or sound effects from the visuals, for that matter, just unadulterated music). As for that music itself, it is, in many ways, a sumation of the entire 2010 season of Doctor Who, with snippets of little Ameilia's fairy tale theme from The Eleventh Hour and eventually culminating in the amazing Doctor's Theme. I have to say that did get to me slightly, I so love that theme and seeing it in context of the Doctor sacrificing his own life at the end there, the way it built up gently and then blasted in, full force... Magical stuff. The three hosts, Karen Gillan, Arthur Darvill and Matt Smith all took to the stage, for the introduction of the final two pieces. Matt Smith gave us humourous little insight, off autocue, into his being chastised backstage for going to the wrong part of the stage! 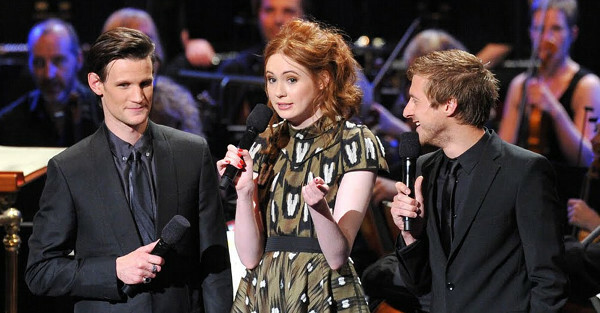 Karen Gillan nearly corpsed at his admission, Matt Smith tried to pour petrol on that fire with "Don't laugh, Karen! ", with her responding "I'm keeping it together!" Though she was clearly having trouble not laughing throughout that, I can only imagine the hysterics once they got off stage! Arthur, clearly being a more straight-laced sort of chap, managed to not get dragged in! I have to say, it is always a joy to see Karen and Matt together out of character (such as in The Big Questions or when they interviewed each other on the Offical BBC Doctor Who website), they clearly set each other off! But onto the music! Another returning piece from the 2008 Prom is the 'Song of Freedom' that accompanied the amazing scenes at the Journey's End with all of the Doctor's (New Who) friends around the TARDIS console with him. Clearly a very popular piece of music and one that is very well known thanks to the 'Series 4' soundtrack CD and the previous 2008 Prom (the Cardiff 'Doctor Who: A Celebration' concert for Children in Need preceeded it being written else I'm sure it would have been there, too). As ever, nice rousing and joyous stuff, though I have to admit (for me) it does feel a little artificially rousing in a way that, say, 'This is Gallifrey' doesn't. I don't know why that is and I suspect it is just me who thinks that. Nonetheless it is the perfect send off for the Prom, as it was last time. That wasn't quite the end, though. No, they had another attempt at the Doctor Who theme. In 2008 it didn't work particularly well, I thought. This version of the theme translated to full orchestra much better. 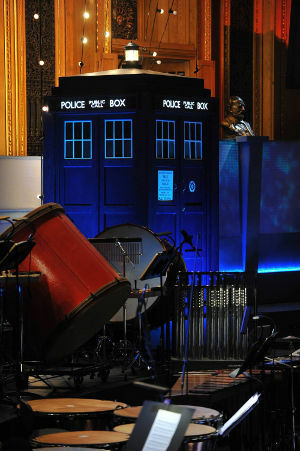 As with the 2008 Prom, we again had Murray Gold take to the stage and join in for the Doctor Who Theme on piano. How else could they finish the prom? No orchestral version of the theme will be perfect (although I rather like the TV movie version, especially the piano bit!) but this came pretty close. As an aside, neither of these final pieces of Doctor Who music had acompanying visuals on the big screen. Instead, like the non-Who music, they simply relayed live close-ups of the orchestra at work. A standing ovation greated the orchestra and choir as they stood, with the conductors (Ben Foster and Grant LLewellyn), Murray Gold, the male and female solo vocalists (Mark Chambers and Yamit Mamo) and Karen Gillan, Arthur Darvill and Matt Smith all taking to the stage for their bows. Clap for as long as we could (I thought my hands were about to explode!) but sadly we just couldn't tempt an encore out of them. Probably partly because this was an evening performance (as compared to the single 2008 Prom that was a midday affair) and, somewhere along the way, we'd managed to get 20 odd minutes behind the official ending time of 21:30. That's a big shame, last time they encored 'Song of Freedom'. I'd have liked for them to have done an abbreviated 'I am the Doctor', perhaps without the visuals and Doctor dialogue. Oh well, maybe next time..? Overall it was an amazing experience again. 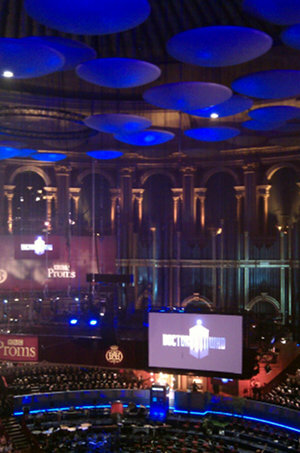 I felt so privileged to have been at the 2008 Proms but to also have attended the 2010 Proms is even more incredible. I have to say, though, I came away thinking the 2008 Prom was a little better than this 2010 one. I don't know why - perhaps because it wasn't new to us this time or perhaps because they just had less music to draw upon this year. 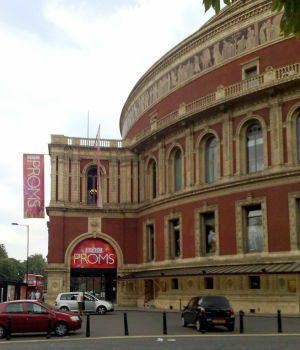 Is a piece of me still at the Royal Albert Hall after this Prom? Yes, though perhaps a smaller piece than was left in 2008. I was so tempted to get up early the next morning (extremely early, it would have to have been) to try to get a standing Arena ticket to see it performed again on the Sunday. In the end, though, I was too exhausted to seriously contemplate it, it took a lot of energy and willpower to keep my composure during some of it - that's how good the 2010 Doctor Who Prom was.